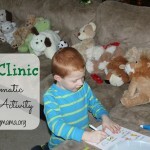 Dramatic play is important to a child’s development. 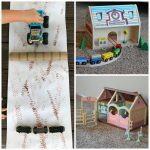 Children need time to play make-believe and do open-ended play activities. 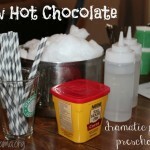 The great part about dramatic play is that there are no specific directions for the activity. 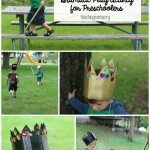 Just invite the child to play with costumes or props and let them use their imagination to play! Dramatic play is also called pretend play. Experts define it as as a type of play where children assign and accept roles and act them out. It’s more than just wearing a costume. 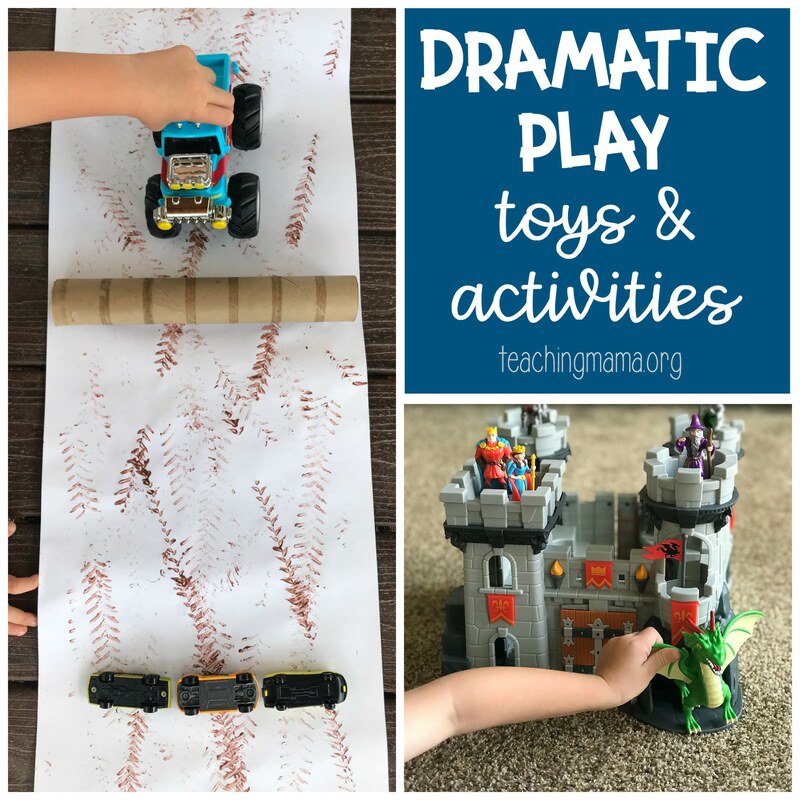 Dramatic play helps with communication skills, language development, social skills, gross and fine motor skills, and even math and reading skills. 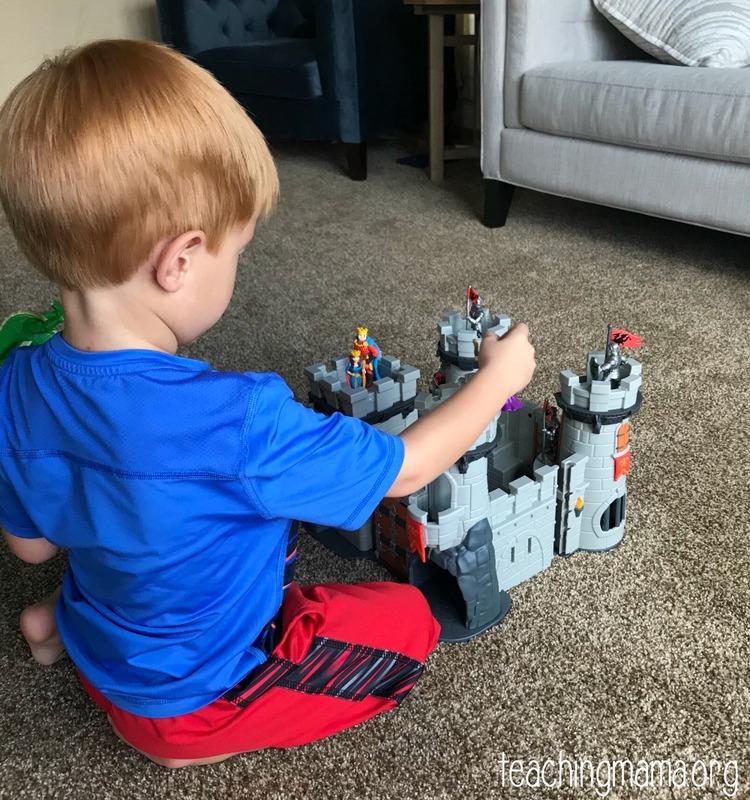 Today I’m excited to share some great dramatic play toys from Lakeshore Learning’s brand new Gifts for Growing Minds collection. Each product is thoughtfully designed to encourage kids to imagine, design and invent their own unique play experiences. These would be fabulous to have in the classroom or at home. These non-battery, non-electronic toys will lead to hours of imaginary play for kids! You can find all of the new products here. First is the Royal Kingdom Adventure Castle. This set is so fun! 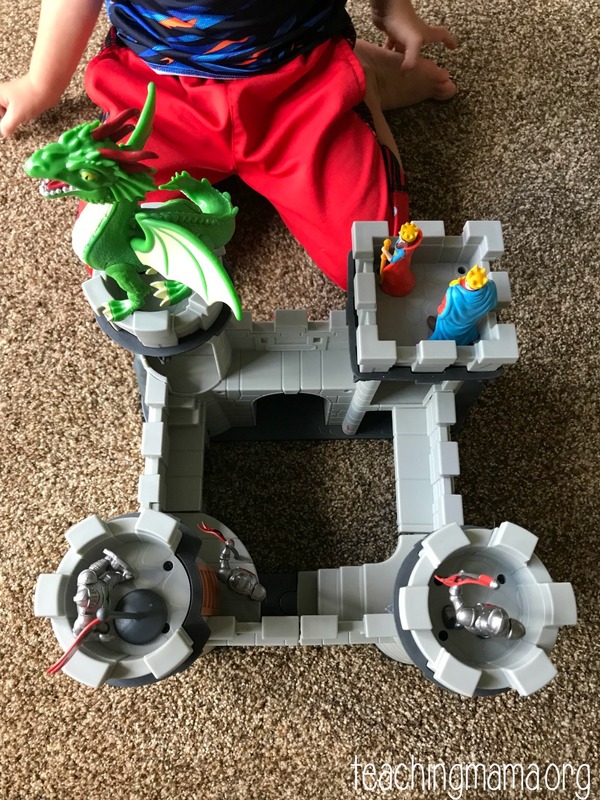 My 4 and 7 year old boys absolutely love playing with this! 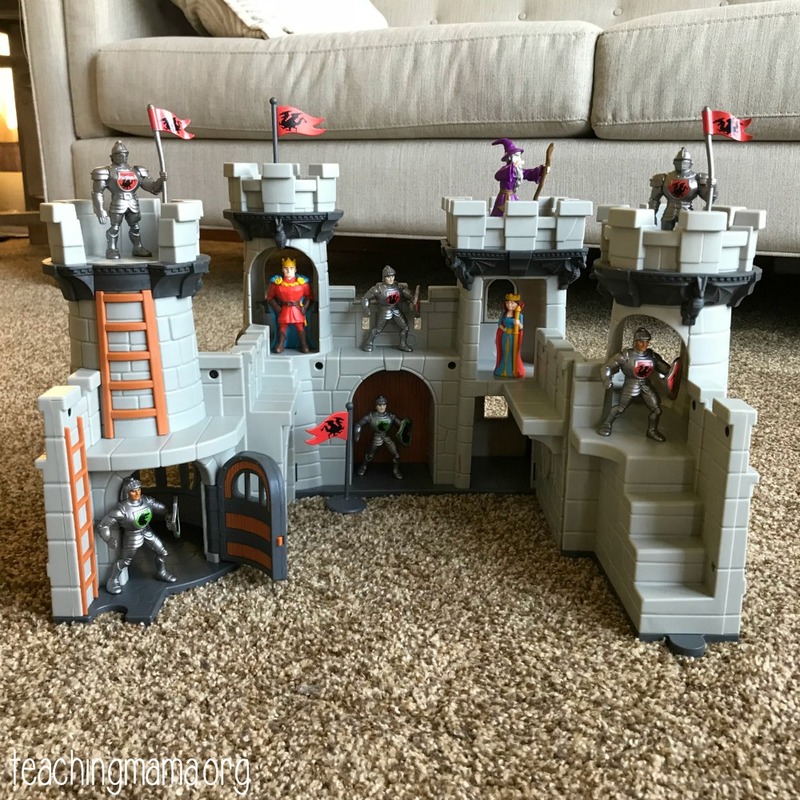 The set comes with a castle, which swings open so you can play inside the castle better. It also has a pretty cool dragon, a king and queen, 4 knights, a wizard, 2 guards, and 2 flags. Lots of accessories to play with! Everything is so well made in this set. It is a set that will last for years and years. A wide age range can play with this and it’s great for boys or girls! My son’s favorite thing about the set is the little hiding places he could put a figurine in. You can open the castle up so it’s easier to play. 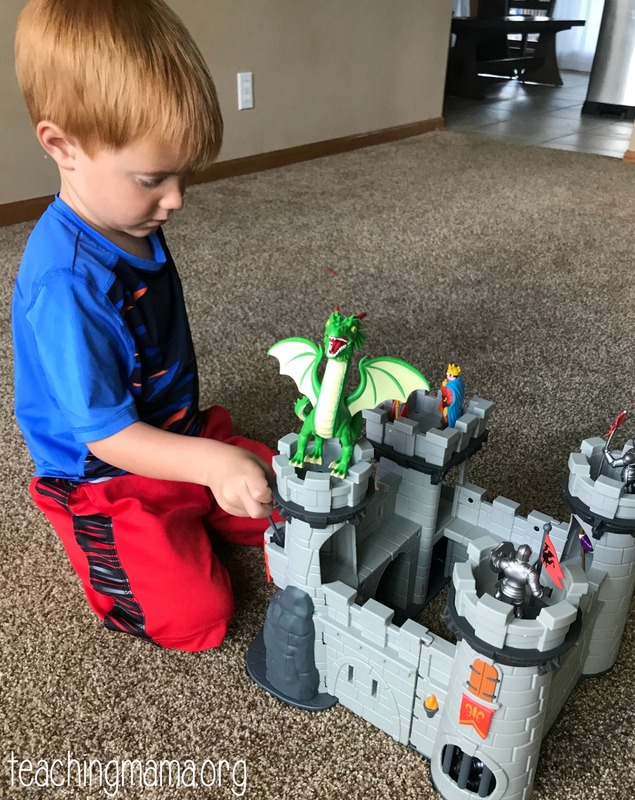 You can purchase the Royal Kingdom Adventure Castle here. 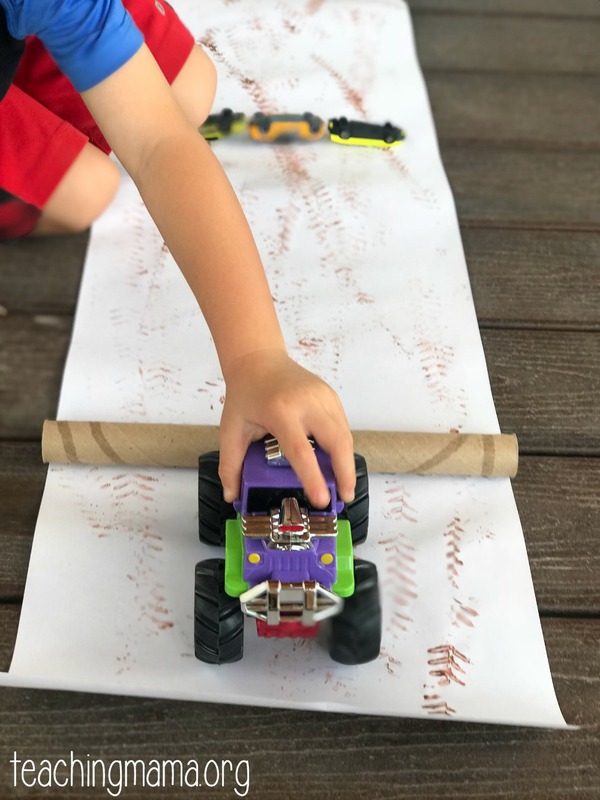 The second dramatic play toy is the Snap and Design Monster Truck. These trucks are a blast!! The cool part about these toys is you can customize the trucks. You can change the body and the fun accessories. They are super easy to snap on. In fact, it’s a great way to work on fine motor skills. Along with the body of the truck, you can snap on pieces in three spots on the truck. Once you’re ready to play, you can just pull back on the truck, release, and watch the truck zoom across the room! I set up an invitation to play for my 4-year-old to play with. 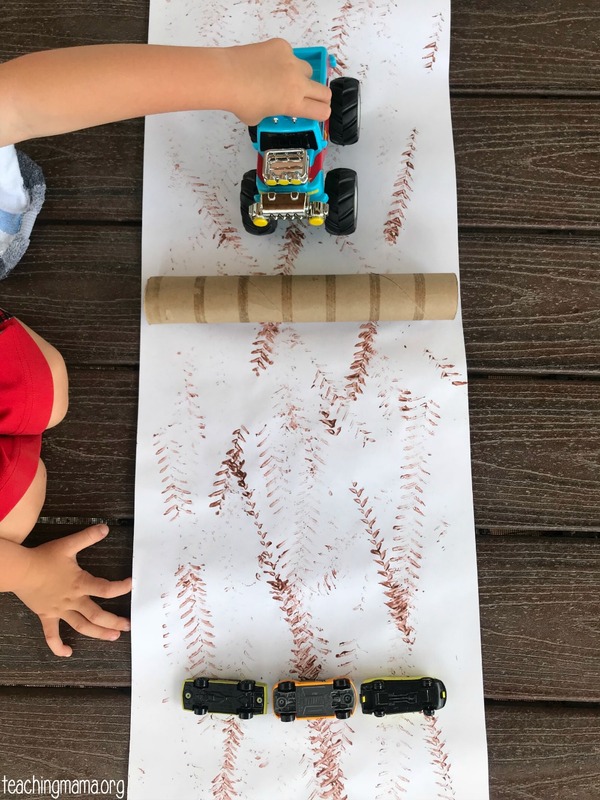 I laid out a roll of paper, painted the bottom of monster truck wheels with brown paint, and made tracks on the paper. 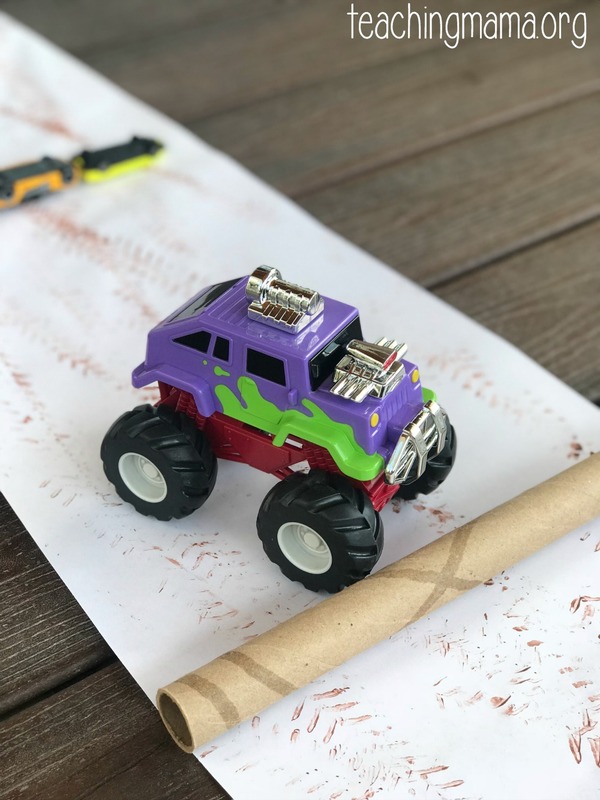 Then I glued on a couple paper towel rolls and some cars for the trucks to jump over. He needed no instructions for this activity. He just started playing and racing the trucks. 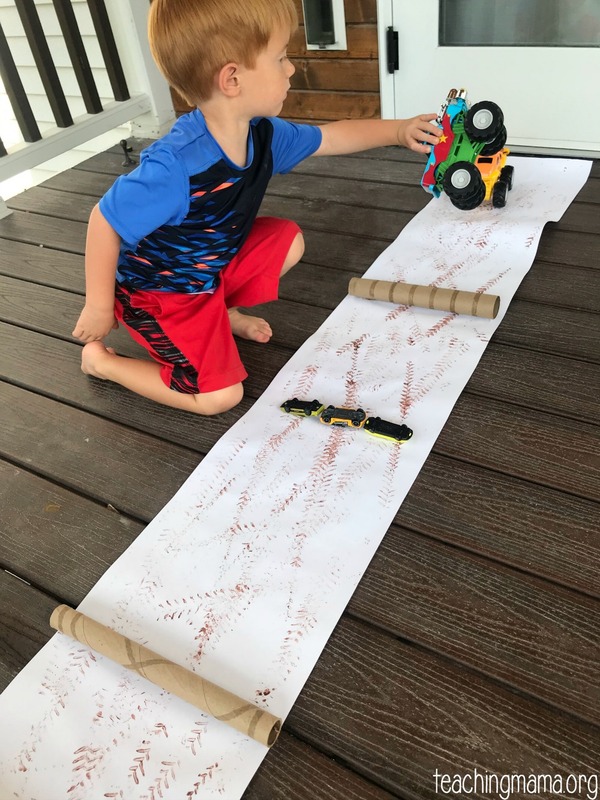 Lincoln wanted to add cars underneath the paper to make it harder to jump. 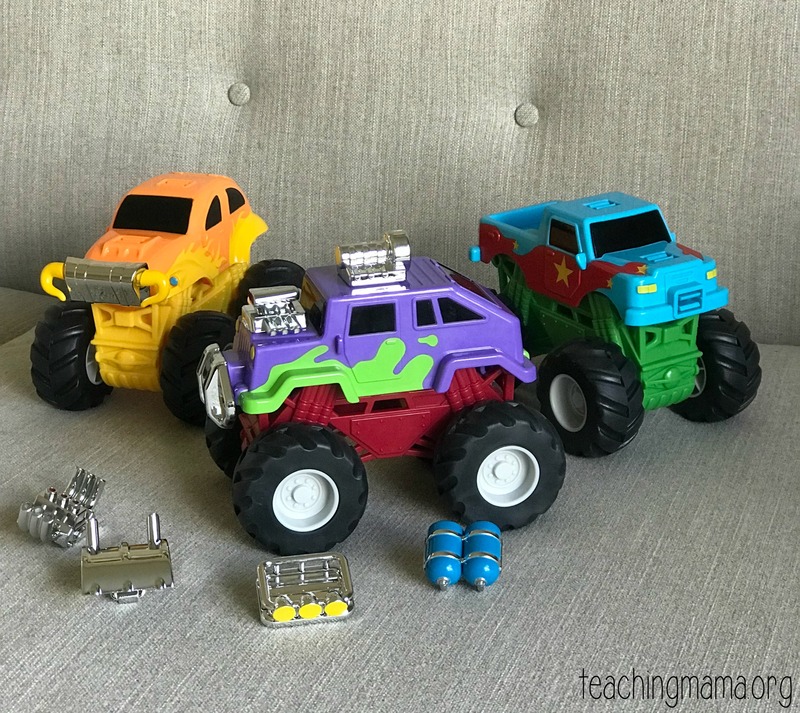 This is just one activity for using these monster trucks. You don’t need to have a specific invitation to play for these trucks, but I thought I’d share one way you could use them. 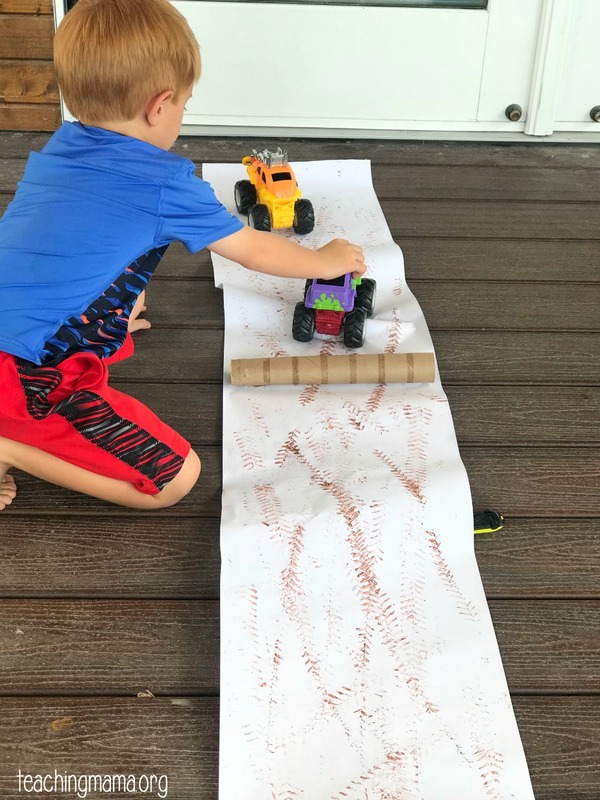 My three boys have had fun racing the monster trucks down our hallway, too! You can buy the Snap and Design Monster Trucks here. Lakeshore has so many great toys and activities for dramatic play!! Check out what they have to offer here. 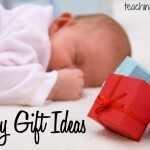 These would make great gifts, too! I’m excited to share an exclusive coupon with you! Grab the coupon for 25% off any non-sale item by clicking the button below.